In our time cryptocurrency has become a buzzword in both industry and organizations for higher education. As one of the most with good outcome crypto money used in a country, bitcoin has got pleasure out of a very great a good outcome. The architectural components are divided into three layers: the shared data layer, the shared protocol layer and an application layer. 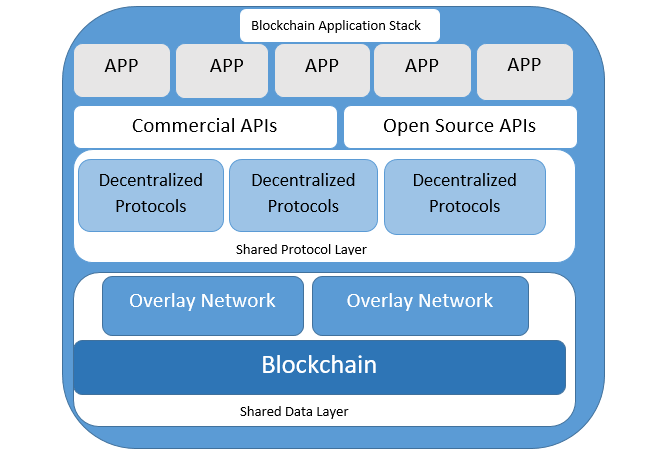 The shared data layer and shared protocol layer which are decentralized, open source and as per diagram you see covers the 80% of the entire stack. In the perspective of bitcoin the shared data layer is the Blockchain and for the decentralized protocol part of the shared protocol layer the bitcoin protocol. With the use of the Blockchain technology, we can develop the open source, decentralized protocols with built-in data because of overlay networks and the Blockchain, validation, and transactions that are not controlled by a single entity. In this, scenario the traditional architecture of software businesses breaks down. This is where Blockchain consulting companies come into play. Bitcoin is the best example of a decentralized protocol on top of a shared data layer, and we’re already well aware of how it’s affecting money and finance. Decentralized conventions over the Blockchain can possibly fix each and every piece of the stacks that make this service profitable to customers and investor. An open API is publicly available for all developers to access their data. Open API allows developers and outside of an organization’s workforce to access backend data that can then be used to improvise their own applications. It will make it quick and easy for developers of any skill set to quickly build an application and experiment on top of these decentralized protocols is paramount to their success. In this layer, it more focuses on the consumer as a part of the stack. Applications built at this layer architecture will in most cases work very similarly to the ones we have today just as Coinbase works same as to PayPal. The consumer will be able to talk to each other because they are built on the decentralized protocol which is a big difference to consumers, wallets can interoperate just like different email applications and bitcoin. This stack is growing from the bottom up. We had as sequence miners, the Blockchain technology , and bitcoin, and now we’re building everything else on top. This is a very interesting set of challenges for developers, entrepreneurs, and investors as so much of the value in the current Internet stack will be commoditized by this architecture. The good thing about this layer is that the user is better off thanks to lower or nonexistent take rates, switching costs, individual ownership of data and consumer market power.